I use the Qstarz 818XT Bluetooth GPS Receiver, but there are other solutions as well like the Dual XGPS150A and the GlobalSat BT-368i. I am recommending the Qstarz 818XT because I use it and know it works great, but if you do a search for Bluetooth GPS Receiver on Amazon you will find many options and plenty of reviews of products if you do not want to go with my recommendation. One thing to keep in mind is the update frequency as discussed below. You will probably want something that has a 5 Hz update frequency (5 times a second) . To connect your phone to the Bluetooth GPS download the free app called "Bluetooth GPS" from the google play store. The Pelican 1010 micro case or the OtterBox 1000 Series Waterproof Case are both good options for protecting your GPS from the elements. The internal GPS chip in cell phones require a lot of battery to operate. When using the internal GPS with my phone and the brightness set at full, I experience around 3 hours of battery life. By using the Bluetooth GPS receiver, I am able to get approximately 5 1/2 of continuous use with the screen brightness on full. Though battery life is very important, another huge advantage to "outsourcing" the GPS function of the phone via a Bluetooth GPS Receiver is the increase in update frequency. The typical phone GPS chip updates its location at best once every second (1 Hz). With a Bluetooth GPS, this update freqency can be as high as 10 times a second (10 Hz). The Qstarz 818XT has the capability to update at rates up to 10 Hz via a hardware switch. This switch can be programmed via a usb cable and a computer program comes with the unit. I have been very satisfied by setting this update rate to 5 Hz. The accuracy of the chip in a Bluetooth GPS will be much better than the GPS chip that is built in to modern day phones. I use a bike mount waterproof case (like the one on the left) for my Samsung Galaxy SIII. I bought mine on ebay for $25, but similar ones are also available via Amazon. I attach this to the boat via 3M Dual Lock "velcro". 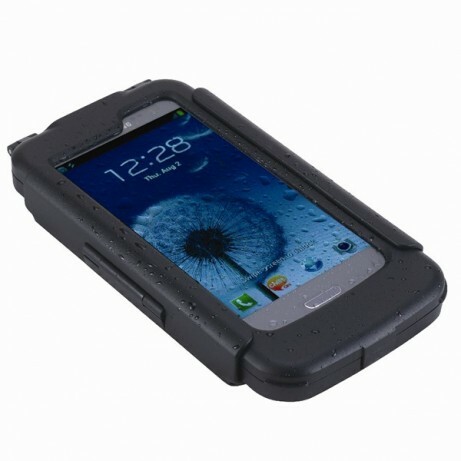 Other inexpensive waterproof cases are also available such as ones from iPEGA as well as the waterproof bag type cases. More expensive premium cases like the SEIDIO OBEX case are also available for the Galaxy S3, and I am sure there are similar solutions for other Android phones as well. In my experience and due to the waterproof cases having a plastic screen protector over the screen, glare is significantly reduced compared with the straight glass screen of the phone. Use any of these recommendations is at your own risk. 3M Dual Lock is a great product. 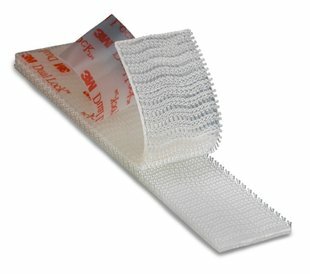 It provides a superior reusable mounting solution to traditional velcro. This product is meant for high temperature environments and does not wear out as quickly as traditional velcro. I personally have tested and use the Dual Lock 250 on both my phone case and boat (the number signifies how many fasteners per square inch and thus is representitive of how strong a connection you will get). They also make this product with lower (170) and higher density (400) of fasteners, but the 250 to 250 connection is very strong and is what I recommend. This product is available via Amazon for $20-30 for two 10ft rolls, or email me and I can send you a couple feet via USPS for a small "donation".